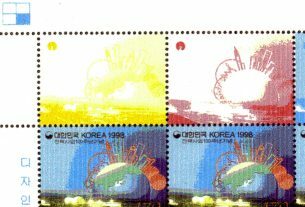 Home > Korean Philately > Q&A > Reader’s Question: Was this North Korean block margin intentional? I have seen this North Korean 1962 Scott 394 before, and have this block with the unusual bottom margin with the blue colour omitted. I read something about this before, maybe in the KP, but I can’t remember what it was. I believe it was done intentionally and not an error, but I cannot remember why this was done on the bottom margin. Hopefully one of our North Korean experts can tell me why it happened this way. 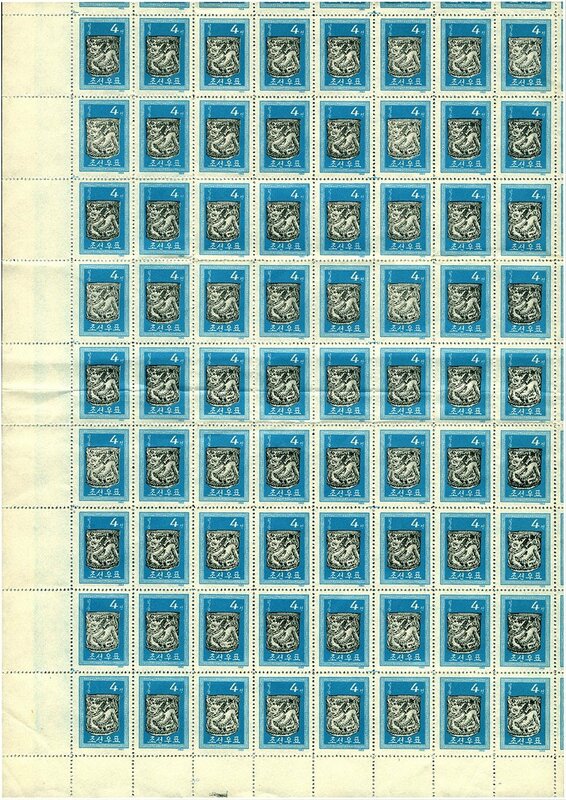 The complete block of four of the Scott 394 as scanned by Robert Finder. If you have an answer to Robert’s question please leave your answer below in the remarks field. It must be an amazing find if anybody sees it for the first time. 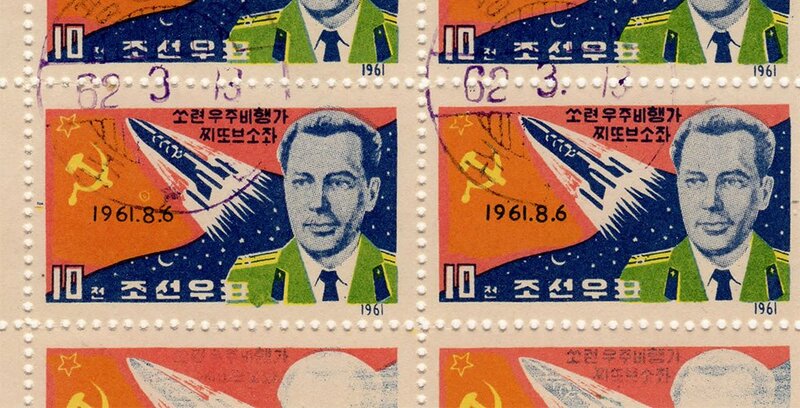 However, if he sees more stamps he will find it’s quite common in NK stamps. That’s the residual of printing process. 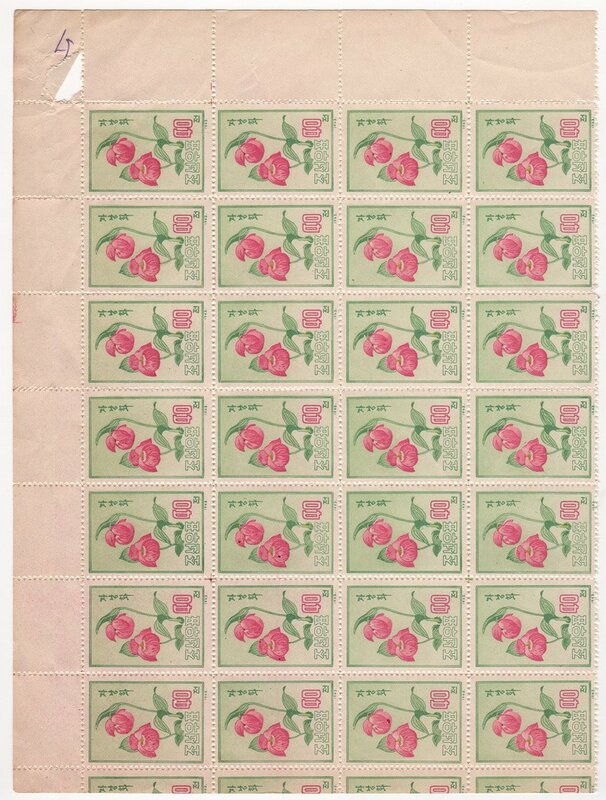 Early NK stamps don’t have the concept of “complete sheet” in printing process but tend to print as many stamps as they can in one sheet of paper. Thanks very much for the answer. 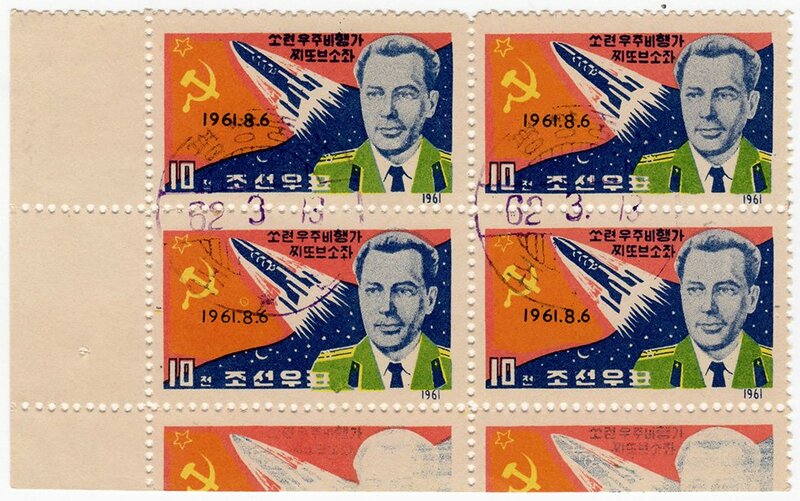 I thought it might be something like that, but since I really do not collect North Korean stamps, I was not sure. Biggest DPRK sheet in my possession is 1969 Scott’s A689 (KSC 863) Rural Technical Development, 40ch. Mechanical fertilization and spraying has total of 80 stamps in a single sheet (4×10 and 4×10) and is measured at 46.5 cm by 31.4 cm. This sheet is without block margin. However, I have 1962 Scott’s A352 (KSC 379) Antiques of the Koryo and Yi Dynasties, 4ch. Brush Case with 72	stamps in a single sheet (8×9) and measured 38.5 cm by 27 cm. This sheet has block margin. 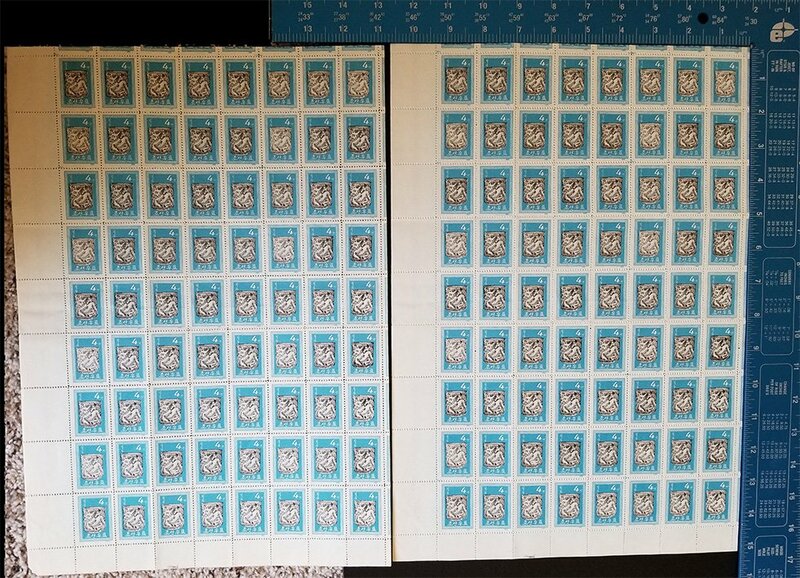 I believe the block margin is used to produce maximum number of stamps with available paper at the time. It has nothing to do with being international print. The part about using as much as possible of the paper available I understand. But what then would be the cause of the missing colour on only that particular part of the sheet? 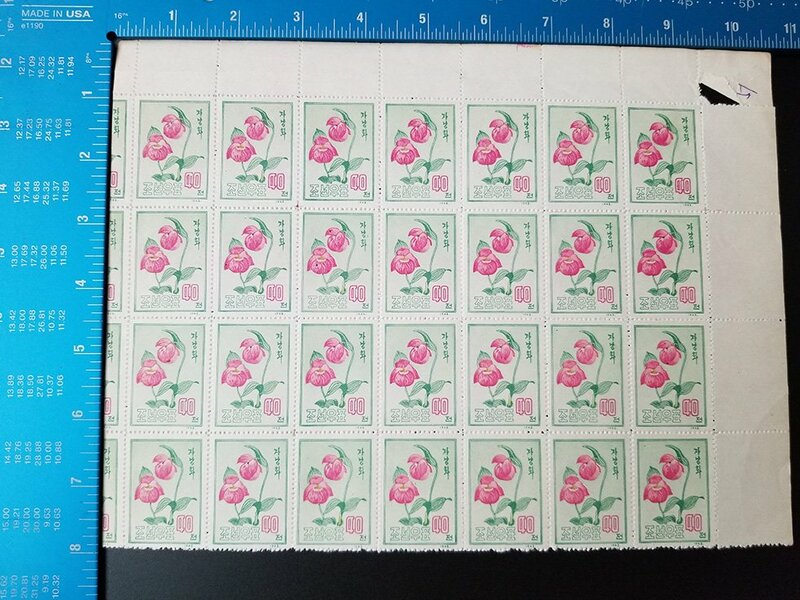 I would think it would be “all or nothing”: either all colour on the whole of the available paper (including the partial stamps) or otherwise only colour (whether all layers or partially missing colour) on the actual stamp part of the sheet. But now the complete stamps have all colours, but the part stamps are missing at least one colour layer. How did that happen? I believe the block margin was created above missing color. It is missing the part not the color.